How do I find medical help? What home-based exercises should I do? What medications should I take? What about nutritional supplements or remedies? I need support and help with coping. What are my options? I want to travel. What precautions should I take? 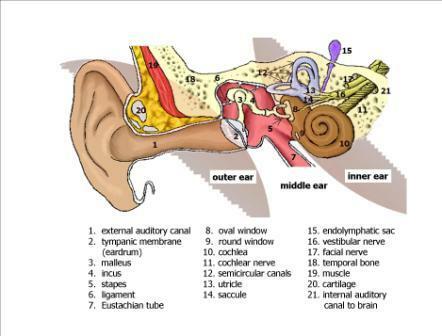 Anatomy of the ear - what does it look like? How do I access the patient forum? Do I need a website login? How do I get one? How do I add my practice to your provider directory of vestibular disorder specialists? Can I get a discount on professional membership? How many practice locations can I include in my provider directory listing and how do I add more than one? Where can I find professional development opportunities? I teach courses or am organizing a conference. How do I add my event to your calendar? How do I access the member forum? How do I submit an article to be published on the VeDA website? How can I order publications in bulk? Will you mail materials to a friend/family member who does not have Internet access? May I make duplicate copies of your publications to distribute or reproduce your content on my website? Are online transactions on your website secure? What type of payment do you accept? Can I order in non-US currencies? There was a problem with my credit card transaction; what should I do? How do I find medical help? What kind of specialist do I need? Medication is a short-term strategy because it dampens symptoms, making it more difficult for the brain to learn to compensate for vestibular dysfunction. However, for people in an acute stage of dizziness, medication is sometimes used. The kind of medication you are prescribed depends on your medical history and diagnosis.See our page on medications used to treat vestibular disorders for more information. One of the most enriching benefits of donating is becoming part of an online community of people who understand what it’s like to have a vestibular disorder. You also receive a complementary subscription to VeDA’s quarterly newsletter, On the Level, with information about vestibular research, rehabilitation, and more! Best of all, you’ll be helping VeDA promote awareness for the challenges of dealing with a vestibular problem. VeDA offers professional membership for vestibular healthcare professionals, which includes a listing on our popular provider directory, access to co-brandable, digital copies of our publications, and the opportunity to list workshops and classes in our online calendar of events. How do I add my clinic to your provider directory of vestibular disorder specialists? To be listed in the provider directory, you must be a VeDA professional member with current dues. Professional members may submit information online (see instructions below) or print out and return the provider directory form. If you are not yet a professional member you can subscribe online or mail an order form with your check or credit card information. Login to the VeDA website. If you are a current member and do not have a user account, contact customer service. Enter your “Provider Listing Title” as you would like it to appear in our directory (e.g. “My Name, PhD”). Enter other information as appropriate. You may want to upload an image of yourself, enter your professional certifications, etc. Select from a drop-down menu of provider specialties. To select more than one specialty select one and press “Ctrl”, then select another. You may want to add a description of your practice (this can be anything you want to say about yourself). Enter the locations of the clinic(s) where you practice. You can enter up to three (3) clinic locations. Note: Your listing will not be published until it is reviewed and approved. A VeDA customer service representative will review your listing within 3 days. If you already have a professional membership and ARE currently listed in our provider directory, follow steps 1-4 above, then contact a customer service representative - make sure to let us know what "user name" you entered when creating your website account. We will give you permissions that will allow you to edit your listing, then you can continue with the above instructions (steps 5-15) to edit your listing. VeDA prices its Individual Professional membership competitively, but there are a few ways to save. Do you have a discount code? Due to software changes, VeDA is currently unable to accept all discount codes online - some can only be redeemed offline. If you are not sure how to redeem your discount code, contact us. Group Practice and Corporate memberships come at a discount for listing more providers. Employees of Corporate members may be eligible for special employee-discounted memberships. VeDA partners with many trainers - if you are getting vestibular-certified or even just taking a class to brush up, ask your trainer - they may have Discount Member Flyers and/or a Discount Code. To redeem your discount code, download an offline order form or call (800) 837-8428. How many practice locations can I include in my provider directory listing and how can I add more? How can I order bulk publications? May I make copies of your short publications to distribute or reproduce your content on my website? Yes, VeDA has the highest level of security, called SSL or Secure Socket Layer, which are cryptographic protocols designed to provide communications security over a computer network. You can see this in our URL, which has an "s" at the end of the "http" (i.e. https://). VeDA uses a credit card processor which uses a secure payment gateway. If we ship a broken or defective product. To further our mission, VeDA accepts advertising and sponsorship under strict guidelines. We will refuse any advertisement that we believe is incompatible with our mission. The presence of an ad on our site or in one of our newsletters does not imply endorsement of the advertised company or product. Advertisers and sponsors must not make unsubstantiated health claims or suggest VeDA has endorsed a product. VeDA maintains a distinct separation between advertising content and editorial content. All advertising content on VeDA’s website or in one of our newsletters is clearly labeled as an advertisement. Sponsored areas of the site are labeled as such, and the sponsoring organizations are identified. For more detailed information about advertising and sponsorship click here.